American physician mission specialist astronaut 1980-1991. Was married to astronaut Anna Fisher. Status: Inactive; Active 1984-1991.. Born: 1946-04-01. Spaceflights: 1 . Total time in space: 7.10 days. Birth Place: Dallas, Texas. Educated Stanford; University of Florida. PERSONAL DATA: Born April 1, 1946, in Dallas, Texas. Married to the former Anna L. Tingle of St. Albans, New York. They have two daughters. EDUCATION: Graduated from North Syracuse Central High School, North Syracuse, New York, in 1964; received a bachelor of arts from Stanford University in 1968, and a doctorate in Medicine from the University of Florida in 1975. He did graduate work in biology at the University of Florida from 1969 to 1971, and did graduate work in Engineering at the University of Houston from 1978 to 1980. ORGANIZATIONS: Diplomate of the American Board of Emergency Medicine and a member of the American College of Emergency Physicians. SPECIAL HONORS: American Astronautical Society Victor A. Prather Award for Outstanding Achievement in the field of Extravehicular Activity (1985), the FAI Komarov Diploma (1985), the NASA Space Flight Medal (1985), and the NASA Exceptional Service Medal (1988). Dr. Fisher has also received Group Achievement Awards for EMU and MMU Development (1983), and for Payload Assist Module (PAM) Software Development and Vehicle Integration (1983). In 1986 he was named an ad hoc member of the U.S. Air Force Scientific Advisory Board, and was appointed a member of the NASA Medicine Policy Board in 1987. EXPERIENCE: After medical school, Dr. Fisher completed a surgical residency from 1975 to 1977 at UCLA's Harbor General Hospital in Torrance, California. He entered private practice in emergency medicine from 1977 to 1980, while serving as an instructor in medicine at the University of South Florida. He has logged over 2,000 hours in prop, rotary-wing, jet aircraft and spacecraft. NASA EXPERIENCE: Selected by NASA in May 1980, Dr. Fisher became an astronaut in August 1981. His technical assignments to date include: scientific equipment operator for high altitude research on the WB57-F aircraft (1980-1981); astronaut medical support for the first four Shuttle missions (1980-1982); astronaut office representative for Extravehicular Mobility Unit (spacesuit) and Extravehicular Activity (EVA) procedures and development, including thermal vacuum testing of the suit (1981-1984); astronaut office representative for the Payload Assist Module (PAM-D) procedures and development (1982-1983); astronaut office representative for Shuttle Mission Simulator (SMS) development (1983); support crewman for STS-8; CAPCOM for STS-8 and STS-9; Remote Manipulator System (RMS) hardware and software development team (1983); Manned Maneuvering Unit (MMU) development team (1983); Deputy Director of NASA Government-furnished and Contractor-furnished Equipment (1982-1983); Chief of Astronaut Public Appearances (1985-1987); Head, Astronaut Office Space Station Manned Systems Division, and Health Maintenance Facility (1987-1989); Astronaut Office representative on space crew selection and retention standards for Space Station (1989-1991). Dr. Fisher also practiced emergency medicine at a hospital in the greater Houston area in conjunction with his astronaut duties. Dr. Fisher was a mission specialist on STS-51I, which launched from Kennedy Space Center, Florida, on August 27, 1985. STS-51I was acknowledged as the most successful Space Shuttle mission yet flown. The crew aboard Space Shuttle Discovery deployed three communications satellites, the Navy SYNCOM IV-4, the Australian AUSSAT, and American Satellite Company's ASC-1. They also performed a successful on-orbit rendezvous with the ailing 15,400 pound SYNCOM IV-3 satellite, and two EVA's (space walks) by Dr. Fisher and Dr. van Hoften to repair it, including the longest space walk in history. Discovery completed 112 orbits of the Earth before landing at Edwards Air Force Base, California, on September 3, 1985. In completing this flight, Dr. Fisher has logged over 170 hours in space, including 11 hours and 52 minutes of EVA. Dr. Fisher left NASA in 1991 and is currently practicing full-time medicine at Humana Hospital in Webster, Texas. BIRTHPLACE AND DATE: Born April 1, 1946, in Dallas, Texas. His parents, retired Air Force Colonel and Mrs. Russell F. Fisher, reside in Winter Park, Florida. PHYSICAL DESCRIPTION: Brown hair; brown eyes; height: 5 feet 10 inches; weight: 170 pounds. MARITAL STATUS: Married to the former Anna L. Tingle of St. Albans, New York. Her mother, Mrs. Elfreide Tingle, resides in San Pedro, California. Her father, Mr. Riley F. Tingle, is deceased. CHILDREN: Kristin Anne, July 29, 1983, Kara Lynne, January 10, 1989. 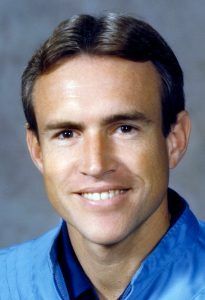 NASA EXPERIENCE: Selected as an astronaut candidate by NASA in May 1980, Dr. fisher became an astronaut in August 1981. His technical assignments to date have included: scientific equipment operator for high altitude research on the WB57-F aircraft (1980-1981); astronaut medical support for the first four Shuttle missions (1980-1982); astronaut office representative for Extravehicular Mobility Unit (space suit) and Extravehicular Activity (EVA) procedures and development, including thermal vacuum testing of the suit (1981-1984); astronaut office representative for the Payload Assist Module (PAM-D) procedures and development (1982-1983); astronaut office representative for Shuttle Mission Simulator (SMS) development (1983); support crewman for STS-8; CAPCOM for STS-8 and STS-9; Remote Manipulator System (RMS) hardware and software development team (1983); Manned Maneuvering Unit (MMU) development team (1983); deputy director of NASA Government-furnished and Contractor-furnished equipment (1982-1983); Chief of Astronaut Public Appearances (1985-1987); Head, Astronaut Office Space Station Manned Systems Division (1987-present). Dr. Fisher was a mission specialist on STS 51-I which launched from Kennedy Space Center, Florida, on August 27, 1985. The mission was acknowledged as the most successful Space Shuttle mission yet flown. The crew deployed three communications satellites, the Navy SYNCOM IV-4, the Australian AUSSAT, and American Satellite Company's ASC-1. The crew also performed a successful on-orbit rendezvous with the ailing 15,400 lb SYNCOM IV-3 satellite, and two EVA's (space walks) by Dr. Fisher and Dr. van Hoften to repair it, including the longest space walk in history. STS 51-I completed 112 orbits of the Earth before landing at Edwards Air Force Base, California, on September 3, 1985. With the completion of this flight Dr. Fisher has logged over 170 hours in space, including 11 hours and 52 minutes of Extravehicular Activity. CURRENT ASSIGNMENT: In addition to training for future space flight, Dr. Fisher currently serves as the Astronaut Office representative on space crew selection and standards for Space Station. Family: Astronaut. Country: USA. Flights: STS-51-I, STS-61-M. Projects: STS. Bibliography: 12. 1946 April 1 - . Birth of Dr William Frederick Fisher - . Nation: USA. Related Persons: Fisher, William. American physician mission specialist astronaut 1980-1991. Was married to astronaut Anna Fisher. 1 spaceflight, 7.1 days in space. Flew to orbit on STS-51I (1985)..
STS-61-M (cancelled) - . Crew: Fisher, William, Lee, O Connor, Ride, Shriver, Wood, Robert. Backup Crew: Walker. Payload: TDRS/IUS. Nation: USA. Program: STS. Flight: STS-61-M. Spacecraft Bus: Shuttle. Spacecraft: Challenger. Planned TDRS/IUS deployment shuttle mission. Cancelled after Challenger disaster. .